"“If you don’t like guns and you don’t believe in the right to keep and bear arms or the right to carry a firearm, my show will be the most unfair, unbalanced, most biased program you’ve ever heard,” Walters, 51, who also writes the column “One to the Head” for Concealed Carry Magazine and has written two books on gun rights, told POLITICO. And Kate Krueger, who hosts “Talking Guns” out of Scottsdale, Ariz., on 1100 AM KFNX and available online, said she also doesn’t see her show as a place for debating the rights of gun owners. Krueger, who in 1992 ran a failed campaign for U.S. Senate as a Libertarian in New Hampshire, noted that she learned how to use guns and became a Second Amendment supporter because she is a survivor of violence. “I never shot a gun until I was 31,” said Krueger, now “plus 60” and a gun store owner. Guests are on her show to echo the viewpoint that she and her listeners share, she said, not to question their worldview." "Gary Graf said he feared the column would energize gun control efforts -- what he called the anti-Second Amendment crowd. "Publishing Metcalf's back page read was like throwing a bucket of blood in shark infested waters, especially here in California," Graf wrote. "We are one step away from confiscation here as it is, and the anti 2A crowd will be further emboldened by this, especially from something as rock solid as Guns and Ammo. I sincerely hope we can recover from this, but in my state, the champagne corks are already popping."" Really? One step away from confiscation? Champagne corks? Not at my house. This paranoia is both amusing and concerning. Members of the gun rights community face attack for debating any regulation on firearms or expressing support for background checks on firearm sales, a position extremely popular with the American public. In February, when Alan Gottlieb -- president and founder of the Citizens Committee for the Right to Keep and Bear Arms (CCRKBA) -- expressed support for a modest Senate proposal to expand background checks to commercial gun sales -- he faced open revolt from the gun rights community. It is not unusual for a gun writer to lose his or her job for failing to toe the line in opposition to all gun regulations. In 2007, preeminent outdoor writer Jim Zumbo "offered to terminate his association" with Outdoor Life after writing on his blog that semi-automatic military-style rifles should not be used for hunting before branding that type of firearm a "terrorist" rifle. 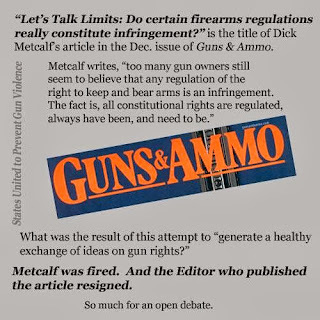 In a letter that resembles Guns & Ammo editor Bequette's apology, Outdoor Life editor-in-chief Todd Smith released a statement that declared, "Outdoor Life has always been, and will always be, a steadfast supporter of all aspects of the shooting sports and our Second Amendment rights, which do not make distinctions based on the appearance of the firearms we choose to own, shoot or hunt with." Zumbo's blog put his entire career as an outdoorsman -- including corporate relationships and a televised hunting show -- in jeopardy. As The Washington Post summarized, "Despite a profuse public apology and a vow to go hunting soon with an assault weapon, Zumbo's career appears to be over." The Miami Herald wrote, "In what might be considered the fastest career collapse in history, Jim Zumbo - for decades one of the nation's most visible outdoor writers and broadcasters - has lost everything in a matter of only a few days." Other articles have been written about this incident as well. It's difficult for reasonable people to understand this kind of anger and vitriol towards someone who is just proposing common sense. Here is just one of the articles written about the Guns & Ammo debacle. This is, as the articles suggest, about the black and white views about guns held by the gun rights extremist crowd. There is no middle ground with these folks. Finishing the job of requiring background checks on all gun sales just makes common sense. The 20th anniversary of the passage of the Brady law is coming up on November 30th. The law allowed for the private sale of firearms without a requirement for background checks on those private sales. Its passage was one of the fiercest battles in Congress and was challenged by the corporate gun lobby who seemingly hate ANY restrictions on who can own guns, what kinds of guns they can have and where they can carry them. We now know that the loophole in the law has allowed for way too many guns to fall into the hands of people who shouldn't have them. The system has been in place for 20 years now and has not resulted in gun confiscation nor a system of gun registration as the hard right gun extremists love to claim. It has resulted in felons and domestic abusers being denied gun purchases. We know that because the NICS system shows that these folks actually try to buy guns from Federally Licensed Firearms Dealers and are denied. Do we want these people to be able to buy guns legally? So this reflexive reaction to anyone who dares to challenge the gun nut talking points doesn't make any sense given the facts. The majority of NRA members don't support a national gun registry scheme called "universal backround checks". In between the laws, and law enforcement, the only tactic that could be used is a national gun registry to enforce UBC's. The Brady bunch, Coalition to Stop Gun violence, Moms Demand Action, and MAIG, can shove it up where the sun don't shine. Hopefully Mark Obenshain wins the AG recount to keep McAuliffe and Barack O'Stalin from putting VA gun owners' into an HHS database. Just like the Soviet Union, use healthcare to ban people from owning guns. Most notably, 85 percent of gun owners and 87 percent of non-owners who participated in the poll support background checks for private and gun show sales, 60 percent of owners and 74 percent of non-owners support a federal database to track gun sales, and 90 percent of owners and 76 percent of non-owners would like laws enacted to prevent mentally ill people from buying guns. More than half of gun owners and non-owners also told pollsters they support bans on semi-automatic weapons, the online sale of ammunition online, and placing armed security guards or police in more schools. The article also has a quote from the pollster:" "I think it might surprise some that gun owners are not uniformly against any kind of gun control," Michael Dimock, director of the Pew Research Center, told NPR on Monday. "It's not that all gun owners see guns as a black and white issue."" And before the gun owners who read my blog get their undies in a bundle over this polling data, this is only one of the many over the span of many years, even one by the infamous Republican pollster Frank Luntz, showing the same results. There is another ridiculous and false assertion that Obamacare will allow for confiscation of guns. This claim was made by the commenter to my blog. It's hard to imagine that anyone could actually believe this stuff. There is a "fact-free" zone where the gun nuts get their information. Dealing with facts is essential when we are dealing with lethal weapons and the large number of senseless and avoidable gun deaths and injuries in our communities. And finally, I wrote previously about the Sanford, Florida Police Chief's suggested changes to the neighborhood watch program after the verdict in the George Zimmerman trial. The Police Chief originally said that the volunteers should not carry their guns and should not pursue an individual while on watch duty. But he has backed off of his statements, understanding that the gun rights community would come after him with a vengeance, believing that their rights have been infringed. This is our gun culture gone awry. A man and his two young children were standing in the checkout line at the C-Town Supermarket in Reading, Pennsylvania. According to reports, when the man reached into his right front pocket to get money to pay his grocery bill he unintentionally discharged a .357 Smith & Wesson handgun that he was carrying loose in his pocket. The bullet hit him in the leg. He was rushed to the hospital. There is no word on his condition. I have written several posts about "law abiding" gun owners who carry their loaded guns in public to protect themselves and their families and then getting themselves into stupid and dangerous situations at grocery stores, restaurants and other shopping places. You can read them here, here and here. To continue with my point about the gun nuts denying reality about who is doing the shootings in America, many of them are committed by "law abiding" gun owners who have become shooters who shouldn't have been able to buy their guns in the first place. Even George Zimmerman, now out of jail after his trial, and should have had enough disqualifiers in his record to be of concern in issuing his permit to carry, is an apparent "law abiding" gun owner. (Cho at Virginia Tech, Jared Loughner, James Holmes, etc. ) I say they are law abiding because they are not prohibited from legally buying or carrying guns even though they should be. That is because of our loose gun laws. And, lastly, as we know, some crime guns are stolen guns ( see New Jersey Mall shooting). The truth must be told in order for the change Americans deserve and want to happen. We can actually do something about at least some of the shootings with some simple measures and awareness campaigns. And we can do it without infringing on gun owners' rights. Americans also have rights to be safe in their communities and their homes from avoidable gun deaths and injuries. This isn't an either/or issue. Our politicians could make changes with the will power to stand up to the false reasoning and extreme views of the gun rights extremists and the corporate gun lobby. My last blog post addressed all the reasons why standing up for common sense and reason helps win elections. Enough is enough. We are surely better than this so let's get to work and make change happen. "If a respected editor can be forced to resign and a controversial writer's voice be shut down by a one-sided social-media and Internet outcry, virtually overnight, simply because they dared to open a discussion or ask questions about a politically sensitive issue . . . then I fear for the future of our industry, and for our Cause. "In publishing Metcalf's column, I was untrue to that tradition, and for that I apologize. His views do not represent mine -- nor, most important, Guns & Ammo's either." “I understand what you believe in when it comes to gun rights, and I believe the same thing,” he wrote. Second Amendment purists must believe that there can be no regulations at all to guns and gun rights. They are wrong, of course, and all Bequette ( Editor) did was fan the flames of this extremist point of view and he gave in to a bunch of bullies. Shame on them all. I fear for our democracy and our country, actually.